Every summer the three biggest short film festivals in North America open the doors of their air-conditioned movie theaters and entertain hordes of festival goers eager to check out the best short films the world has to offer. In Toronto, the CFC Worldwide Short Film Festival exhibited 268 films during its June 10 – 15, 2008 run. In Los Angeles, LA Shorts Fest screened 201 shorts and 42 noteworthy commercials/music videos from August 15 -21, 2008 at the Laemmle’s Sunset 5. The Palm Springs International ShortFest completed the trifecta with 317 films screening August 21-27, 2008 at the Camelot Theatres. With Josh Brolin, Kirsten Dunst, Kate Hudson, Matthew Modine, and Lars von Trier exhibiting their latest films, the number of red hot shorts at the these shortfests has never been greater. Audiences at Toronto’s CFC Worldwide Short Film Festival were treated to a program entitled “Celebrity Shorts” in which the star power was blinding. Lars von Trier contributed his three-minute long “Occupations,” which he made as part of the Cannes “Chacun Son Cinema” (To Each His Own Cinema) program. Kate Hudson’s directorial debut “Cutlass” displayed strong performances by Virginia Madsen, Kristin Stewart, Kurt Russell, and Dakota Fanning. And Bill Murray and Bob Geldof clearly got a kick out of playing themselves in two hilarious shorts, Dan Beers‘ Funny-or-Die action-adventure “FCU: Fact Checkers Unit” and Donald Rice‘s stranded celebrity nightmare “I Am Bob,” respectively. The gala opening night screening at the Bloor Cinema set the tone for the Toronto shortfest. Among the hightlights were Jesse Rosensweet‘s animated “Paradise,” which stars a tin toy voiced by Dave Foley of “Kids in the Hall,” and Nicolas Provost‘s “Gravity,” in which six minutes of screen kisses proved to be great cinema viewing. Luis Cook‘s Aardman animation “The Pearce Sisters” also delighted theater patrons. But when it came to picking the most audience-pleasing film at the 2008 CFC Worldwide Short Film Festival, the audience cast their ballots for “Getting Out (Vaek Fra Spjald)” by a directing team from Denmark, Thomas Glud and Lars Wass. This 22 minute short about an eighteen year-old appearing on Denmark’s version of “American Idol” world-premiered at the fest. 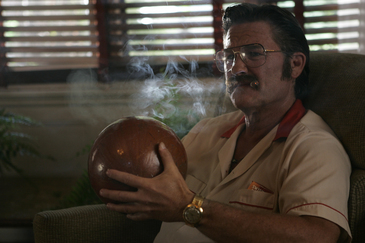 Kurt Russell in a scene from Kate Hudson’s “Cutlass.” Image courtesy of the Palm Springs International Short Fest. Other shorts that generated insider buzz at the LA fest include Edward McGown‘s France-set thriller “Out There,” Krishna DK and Raj Nidimoru‘s bomb-centered “Shor” (Noise), Jennifer Harrington‘s tense cargo-hold thriller “Cargo,” Laurence Dunmore‘s father-daughter drama “Father’s Day,” Gabriel Judet-Weinshel‘s camera-centric experimental film “The Heart is a Hidden Camera,” Chris King‘s adoption drama “Rachel,” Oded Turgeman‘s Hasidic Jew drama “Song of David,” Sean Byrne‘s horror flick “Advantage,” and Bob Giraldi‘s coming out tale “Second Guessing Grandma,” and the German doc about the world’s best freestyle motocross rider, “Travis Pastrana – Driven,” which was also honored with the festival’s best documentary prize. The international animators capturing attention in Los Angeles includes the UK’s Marc Craste with “Varmints,” Australia’s Glen Hunwick with “Mutt,” and Japan’s Kunio Kato with “The House of Small Cubes,” which ultimately took home the fest’s best animation award. As for other award winners, Daniel Ragussis was named best of the fest for his World War I drama “Haber,” Brett Wagner won best drama for his identity crisis drama “Chief,” and Paul Gowers‘ “Ripple” was crowned best comedy. At the 2008 Palm Springs International ShortFest, held from August 21-27, 2008, the opening night screening showcased award-winning shorts from around the world. Gabriel Sirbu‘s Romanian urban romantic adventure “Life’s Hard” picked up kudos earlier this year at Aspen Shortsfest. “Procrastination,” helmed by Johnny Kelly, won Best British Animated Short at the London Short Film Festival. Andrew Okpeaha MacLean‘s Eskimo crime drama “Sikumi” (On the Ice) was a Grand Prize winner at Sundance earlier this year. Enrique Gato‘s amusing wink to Indiana Jones, “Tadeo Jones and the Basement of Doom” (Tadeo Jones y el Sotano Maldito), won the Spanish Oscar (the Goya) for Best Animated Short. And Conor Ferguson‘s geriatric romance, “The Wednesdays,” won the Best Short Award at the Galway Film Festival. Palm Springs also had its share of star-studded shorts playing in the “Shooting Stars” program. In addition to both Kate Hudson’s “Cutlass” and Kirsten Dunst’s “Welcome,” the roster includes Matthew Modine‘s “I Think I Thought,” Jeff Vespa‘s “Nosebleed” featuring a stunningly bloody performance by David Arquette, Ric Halpern and Justin Wells‘s “LA Actors” starring Tony Shaloub, and Bill Purple‘s “Hole in the Paper Sky” in which Jessica Biel not only acts but also acts as a producer. The Palm Springs jury honored several films multiple times. Mirey Brantz‘s “6.5 Minutes in Tel Aviv” won best of fest and best student live action under fifteen minutes. Bogdan Mustata‘s “A Good Day for a Swim” was given the grand jury award and the best live action under 15 minutes. And Marcal Fores‘ “Friends Forever” was honored for best cinematography and the future filmmaker award. For anyone not fortunate enough to make it to Toronto, Los Angeles, or Palm Springs to check out the films on the big screen, keep your eye on YouTube and iTunes. It’s certain that a good percentage of these shorts will be available to view on your computer in the near future.